For the mobile photographer, the iPad is great for viewing and editing photos while on the go—but getting photos onto your iPad isn’t always so convenient. 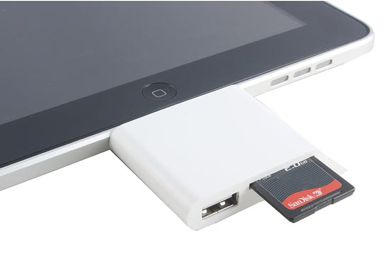 USBfever’s new Memory Card Reader and USB Connection Kit for iPad makes this task easy by providing a slot for SD and SDHC cards as well as a USB port—all in a single device. Similar to Apple’s $30 iPad Camera Connection Kit, the $35 USBfever Memory Card Reader and USB Connection Kit plugs into your iPad’s 30-pin dock-connector port and lets you upload photos to your iPad either directly from your camera via USB or straight off your camera’s memory card. You can even connect your iPhone 4 or iPhone 3GS to the device to view and edit its photos on the larger iPad display. So what does USBfever’s Memory Card Reader and USB Connection Kit offer that Apple’s Camera Connection Kit doesn’t? Convenience. While Apple’s Camera Connection Kit provides the same functionality as USBfever’s offering, it requires that you carry around two separate adapters: one for USB, and one for SD Card. USBfever’s adapter provides both USB and SD Card slot in one device—a convenience that could be worth the extra $5.